It's no wonder that Bridgestone/Firestone and Ford Motor Company appear to be circling the wagons these days. After acknowledging serious problems with Firestone tires on Ford vehicles, and in the wake of a massive tire recall with additional recalls possible, the companies are under assault from several different forces on many different fronts. For Bridgestone/Firestone, in particular, these looming battles must seem like a prelude to Waterloo, the Alamo and Little Big Horn all wrapped up into one. First, there is the legal assault on the two companies. The National Highway Traffic Safety Administration is reportedly investigating more than 750 complaints about Firestone tires alleging links between the tires and dozens of deaths and hundreds of injuries. Some of the families of these victims already have sued Bridgestone/Firestone and/or Ford for manufacturing and distributing allegedly defective products and other lawsuits are sure to follow. In fact, the publicity surrounding the tire recall is likely to increase dramatically the number of individual lawsuits brought against the companies by folks who only now are realizing that there is a possible or likely connection between the tires and an accident they may have suffered on the road. Now, although these lawsuits certainly aren't welcome at Ford and Bridgestone/Firestone, it's fair to say that both companies probably are big enough to handle these particular lawsuits since on a relative scale they will be few in number. Big companies like Ford and Bridgestone/Firestone routinely handle defective product claims and typically have some sort of insurance to help them pay both litigation costs and damage awards. But the tire recall also looks like it will spawn class-action litigation against the two companies, and here is where the possible exposure to both Ford and Bridgestone/Firestone is immense. Some of these potentially massive lawsuits reportedly are aimed at broadening the existing recall; others are reportedly alleging "emotional distress" on behalf of drivers worried about their vehicles crashing or even the resale value of their cars. Not all of these lawsuits, of course, will make it to trial. The more creative the legal theory, the less chance there is that a judge will buy into it. But some of these cases likely will make it to trial and a few might even generate victories for large classes of plaintiffs. Such victories, with punitive damages a possibility, could absolutely devastate either or both companies. Even a settlement in cases involving the strongest class-action plaintiffs could costs the companies precious financial resources. But it gets worse: Adding to the companies' legal headaches is the knowledge that they will have to spend millions and millions in legal fees just to fend off these challenges. And in addition to sustained court expenses, lawsuits bring the sort of corporate uncertainty that shareholders and market analysts simply hate #151; and that's also got to weigh heavily on the folks who run Bridgestone/Firestone and Ford. Then there is a Congressional investigation. While the multi-layered legal assault on the companies relates to their past performance, duties and responsibilities, Congress could play a significant role in changing the way the companies are required to do business in the future. In the past, Congress has stepped in to help the automobile and tire industries when those industries faced certain regulatory action. must acknowledge the storm clouds on the horizon. Then there is the regulatory front. 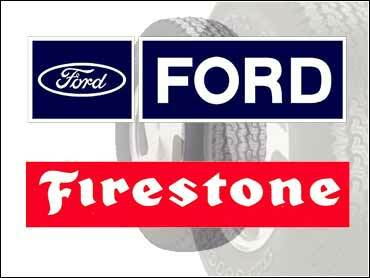 Firestone or Ford face potential fines for failing to recall the tires sooner and they also face potential penalties for withholding documents. And while Joan Claybrook, a former administrator of NHTSA, astutely pointed out this week in The New York Times that those fines and penalties are a drop in the bucket compared to what the companies make. The real regulatory problem for Ford and Firestone may come down the road, in the form of more recalls and safety warnings by an agency angered by the actions and reactions of the companies. These additional recalls and warnings obviously could and will affect sales of all Firestone tires and perhaps Ford vehicles as well, which means less profit for the two companies to work with as they fight the legal and political battles above. Finally, there is the wild card in all of this, the possibility of criminal charges brought in Venezuela against the corporate officers of Ford and Bridgestone/Firestone. Venezuelan prosecutors apparently are on the cusp of a criminal investigation designed to determine whether involuntary homicide and/or conspiracy charges could be sustained for producing faulty tires and then deceiving the government and failing to warn drivers there of the dangers of the tires. Few people expect such charges ever to be brought or, if brought, to succeed. But even this problem area cannot be given short-shrift by the companies. Some of the Venezuelan investigators reportedly have been in touch with some of the lawyers who either already have sued the tire maker or are about to. If these contacts are indeed occurring, they could provide a significant boost to the class-action and product liability lawsuits here, by clueing in plaintiffs' attorneys to where to look for potentially incriminating documents or willing witnesses. And in a case against a large compan like Ford or Bridgestone/Firestone, sometimes just finding the right folks to talk to or the right documents to read is half the battle.